This is my first attempt at making Hard Cheese of any kind. 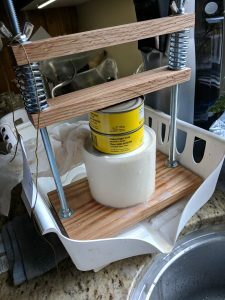 It is also my first full use of our new cheese press! 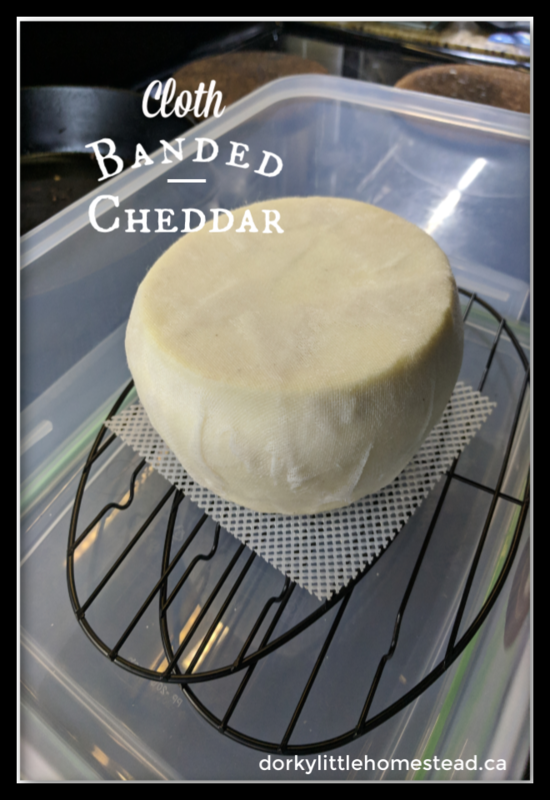 Traditional cheddar cheeses are either wax coated or cloth banded while aging. For simplicity I have used the cloth banding method. aking Cheddar cheese is pretty straight forward. I was surprised that the most intensive thing about this recipe is the time it takes. There is some specific equipment that helps the process along, but nothing outside the realm of ones budget. 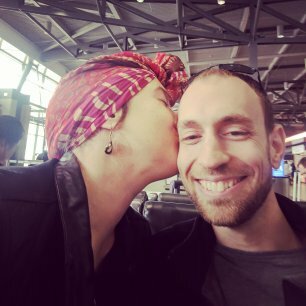 As a result, it’s a great activity for when you have a couple days where you’ll be around the house consistently. You will also see that I mention in the recipe that I age my cheddar in a cheese cave. This isn’t literally a cave…obviously. It’s the term used for the cool, dark, moist place that cheeses hang out in while they age. There are lots of ways to create these spots, and some cheeses are actually happy to age in your regular fridge. I use an old wine fridge. It’s compact and doesn’t draw too much power, while also being able to be set to slightly higher then standard fridge temperatures. Most range in their temperature spectrum from 2-18C which is perfect for cheese aging. A straight forward and delicious traditional cheddar recipe. Sanitize all your equipment, and allow to dry. Warm your milk to 31C (88F), stirring gently whilst bringing up to temperature. Turn off the heat. Add the Calcium Chloride solution and mix well. Add the rennet solution to the milk and mix thoroughly using the same up and down motion for about 1-2 minutes. Cover and allow to set for 40 minutes. 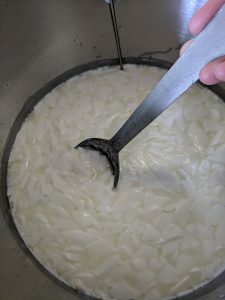 Check for a clean break (The curd will be set on the top of the milk and will split cleanly when broken with a spoon). If necessary, leave for another 10 minutes then check again. 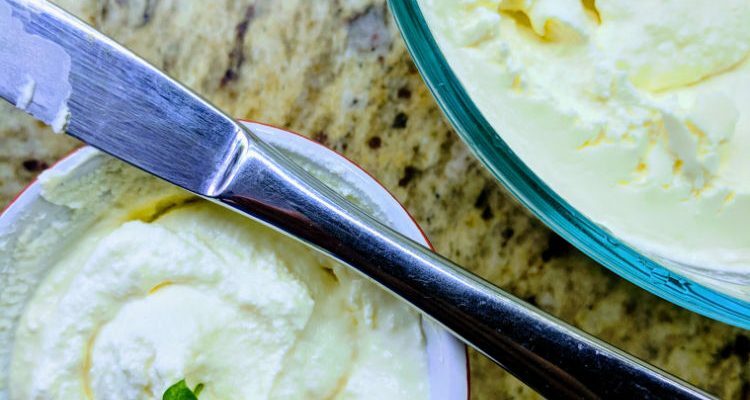 Using a curd knife, or long metal spatula, cut the curd into 1/2" pieces. Cut across in one direction, then across in the opposite direction. To make the horizontal cuts, turn your spatula on a diagonal and make cuts. Cover again and allow the curds to heal for 5 minutes. Return the pot to a low heat, and gradually over 45 minutes raise the temperature to 39C (102F). Stir very gently throughout the whole 45 minutes. This will allow the curds to release more whey. 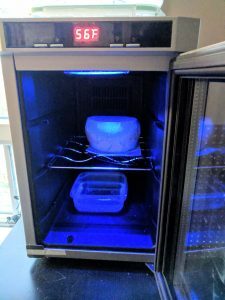 Don't raise the temperature too quickly though, or else your cheese will have a bitter taste. Once the target temperature is reached, remove from heat, cover and allow to rest for a further 45 minutes. Do your best to maintain the 102F temperature the whole time. What should happen during this final 45 minute rest period is the curds should all sink to the bottom and knit together into a slab. Next, drain your curd slab into a cheese cloth lined colander, trying to keep the slab in one solid piece. (Reserve your whey for future use!) Fill a sink with hot water and place your empty pot in it. Then gently lift your curd slab back into the pot. You need the pot and slab to stay warm for this next part, but don't want to burn them on the stove. Cut your curd slab in half, and flip each piece over in the pot. Rest, covered, for 10 minutes. After 10 minutes, gently flip your two pieces again. Cover, rest for 10 mintues. Flip the pieces again. Cover and rest for 10 minutes. One last time, flip those pieces. Cover, and this time rest for 15 minutes. This should be a total of 45 minutes of cheddaring time. 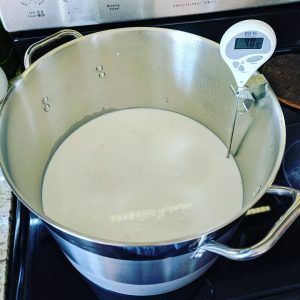 During this time your curds will have expelled even more whey. 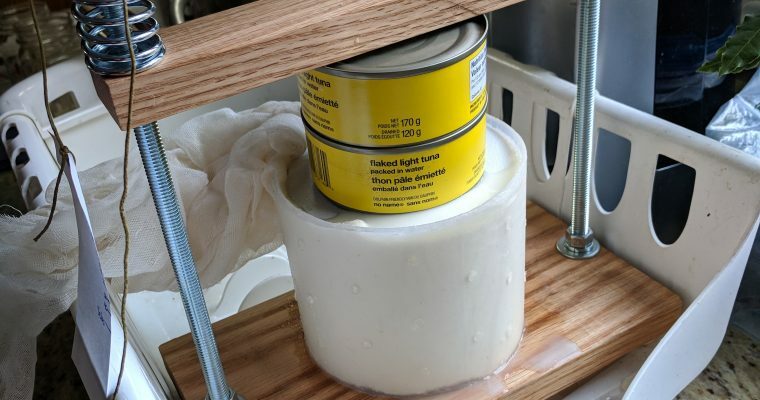 Drain off the last bit of whey and remove your two curd pieces to a cutting board. gently cut them into 1/2" wide fingers. Then break these fingers in half and add them back to your pot. Add the salt into the curds and gently toss the salt and curds together with your fingers. It's okay to break up the curds a bit more in this process. Line a 165mm cheese mold with cheese cloth, and place it on the base of your cheese press. Fill the mold with your milled and salted curds. 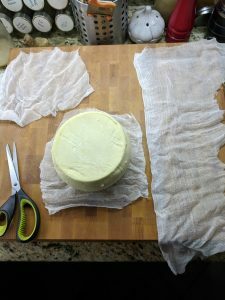 Drape the over hanging cheese cloth across the top of the curds and place the follower on top. Then set your press to 24lbs, and press for 1 hour. After the first hour, gently remove your cheese from the press, unwrap and flip over. Then place it back in the cheese cloth and mold. Press again, this time at 50lbs, for about 24 hours. If you are using a spring press like mine, you may need to tighten the springs several times throughout the 24 hours. 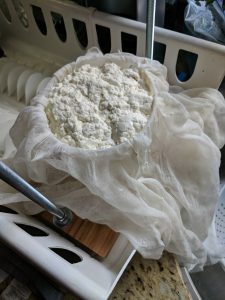 After 24 hours, remove the cheese from the press and cheese cloth, and allow to sit out to air dry on a bamboo mat at room temperature for 2-4 days. Flip it twice a day. 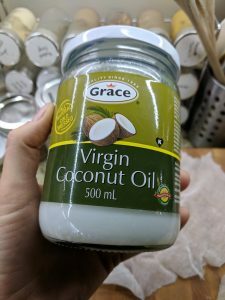 You want it to form a good skin all over. It will turn a bit yellowish all over. That's okay. Once it's thoroughly dried, it's time to wrap it (aka Banding) and age it. For this you will need to cut yourself three pieces of cheese cloth. One long thin piece to go around the circumference and two squares large enough to cover the top and bottom and over hang the edges. 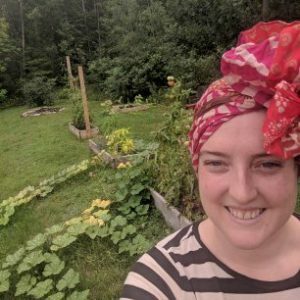 I am using coconut oil to band my cheese but you can use Lard if you prefer. Which ever you choose, it needs to be melted into its liquid form. 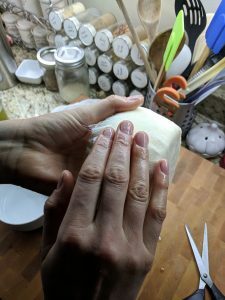 Using clean hands, gently rub the oil all over the cheese. Then, starting with the circumference piece, wrap the cheese and rub with oil to adhere the cheese cloth. Then do the top and bottom. Snip off any excess bits of cloth, and make sure you don't have any dry spots. 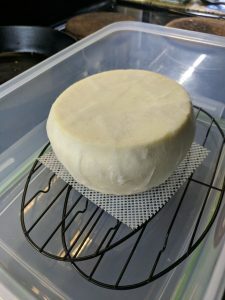 Finally, place your cheese into your cheese cave and allow to age for at least 3 months (Or as long as you want to!) at 80-85% Humidity and 50-54F (10-12C). If you don't have a cheese cave, find a place in your house, like a cold storage or airing cupboard to use instead. A dish of water can be placed below the cheese to help the cave area maintain the right humidity. Flip your cheese once a week.